Alex Nepitt left the Ukraine during a civil unrest in 1909. He worked at lumbering along the Spanish River and also had a brief stint in railroading. In 1912 Alex went to the site of Sellwood mine where he decided to open a General Store to accommodate the residents of a booming Sellwood. Once his business was established, he wrote home to ask Mary Palewictz his childhood sweetheart, to join him at Sellwood. Alex and Mary were married in 1913. In 1922 the mine was on it's last leg and Alex decided to move to the up-and-coming Town of Capreol. When the Sellwood mine closed, Alex had the idea to haul the bricks from the blast furnaces at Sellwood to Capreol where he would build Nepitt's General Store at 78 Young St. Bringing all the bricks by horse and wagon to Capreol was no easy task. It took over a year to complete the new store. Nepitt's General Store opened in 1923. Alex supplied groceries to residents and he sent supplies up and down the C.N.R. line to tourist camps, section workers, Inco diamond drilling camps and the Department of Lands and Forests in Skead for over 50 years. Coal and Wood were in great demand and Alex supplied the town for all their heating needs. 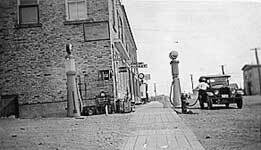 When Oil became the in-thing, Alex opened an Imperial Oil business and made fuel deliveries by tank truck for the first time in Capreol. In the winter, Alex supplied the C.N.R with the ice cut from Ella lake and the Vermillion river. Over the years of cutting ice many horses and trucks met their demise in the icy water of Ella lake. Alex was known as a good and kind man who helped many families through the depression years. Beside every good man is a great woman. Mary Nepitt was known for her giving heart and the smell of cabbage rolls, perahay and borscht coming from her kitchen that was open to all. It is said that Mary sang like an Angel and when she sang the " Indian Love Call " at Ella lake the whole lake even the Whip-poor-Wills stood silent to hear her song.